Happy Sunday all! I was up at 6 am this morning to get started on my day. I relaxed a bit while I sipped my Morning Burst (hot water and lemon. 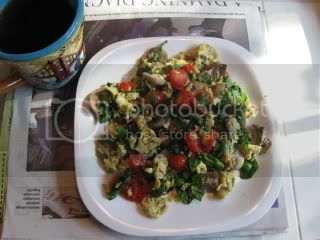 It didn’t take long for my stomach to say, feed me so I decided to start my day with a fantastic Spinach, Mushroom & Tomato Scramble. I sauted the mushrooms in the oil over medium heat for 2 minutes until slightly browned. While the mushrooms cooked, I prepped everything else. I added the eggs and reduced to heat to medium low. Once they were almost set, I added the tomato and spinach and cooked for 2 additional minutes. Tadah! Easy and I LOVE meals that fill my entire plate! I enjoyed it with Sunday’s paper and some decaf cinnamon vanilla nut coffee. It was a filling breakfast that kept me going all morning. I prepared 2 soups for the week, made up my Healthified Potato Salad for The Husband plus the 3 minute chocolate cake (reviews coming soon!) and a secret how-to recipe that you all will see when I am on vacation! The rest of today is another grocery store run so I can prepare my guest post meal, plus getting a brow wax, then, the usual meditation, yoga, ciruits, core and a fun “adventure” workout that is TBD. Today’s theme is about “playfullness”. I hope to fit in some new blog layout time to make a friendly blog for you all. See you all later this afternoon or evening for lunch, after I am all done being busy, busy! wow you do have a busy day! 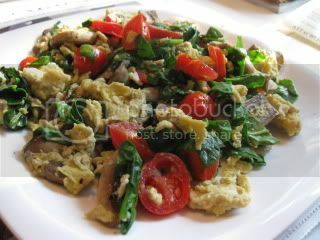 have fun, that bfast looks like it will power you through it all!!! good luck with your busy day =)! Wow, whatever happened to Sunday being a day of rest? 😉 Enjoy your busy day and can't wait to see the new blog layout unveiled! What a busy day!! Hope you get lots of R&R tonight 🙂 That scramble looks heavenly! Way to go, Danica! Can you send some soup my way? I haven't made my extras yet and bedtime is coming soon! Hope you found some down time today! Janetha ~ I know, but, it's in a good way I think…I'll feel so accomplished at the end of the day. Health ~ Ya, I am not so good about sitting still when I have a big todo list. Isn't that what the weekends are for? 🙂 I can't wait to get the new layout actually finalized lol. Anne ~ the scramble was fantastic. Angelea ~ sure my fridge and freezer overfloweth with soup LOL….come on over.